John Brown University announced today a $3 million lead gift for the renovation of the historic J. Alvin Brown residence hall. The total cost for the renovation will be $5.5 million. The renovation will remodel the 93-year old men’s dormitory, updating the rooms into modern suites with features similar to JBU’s newer residence halls. J. Alvin is the oldest university structure on campus. Construction work is expected to begin this summer and be completed by summer 2014. A portion of the lead gift has been designated as a matching challenge, meaning funds contributed by other donors will be doubled by the lead gift, up to $1.25 million. Although exact records are not available, JBU estimates more than 4,000 students have lived in J. Alvin since 1921. Beers said restoring the building would cost less than razing the dorm and building comparable new housing. The cornerstone for J. Alvin was laid in 1920, one year after the university’s founding. The north wing was completed with a $50,000 gift from Texas oilman Jesse H. Jones, who would later become Secretary of Commerce under Franklin Delano Roosevelt, in honor of Jones’ father and mother. The building was named after Joseph Alvin Brown, who was the younger brother of the university’s namesake founder. J. Alvin Brown worked closely with his older brother during the early days of university fundraising, serving as both a member of the board of trustees and vice president. The original wing was completed in 1921 and featured 44 rooms and two teacher apartments. 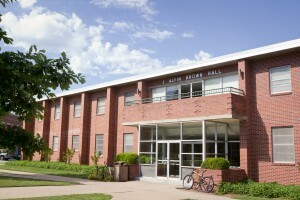 J. Alvin has always been JBU’s primary men’s dormitory. Through the 1940s, the hall regularly housed around 100 men at a time. Through the 1950s, a $500,000 multi-phase project partially designed by students to renovate and expand J. Alvin was launched, with much of the work being carried out by construction management students. The second wing was opened in 1959. By 1963, additional floors had been added to the new wing, giving the building roughly the same shape and student capacity — 225 — that J. Alvin has today. This period of renovation introduced the suite configuration to the hall. In 1983, a new wiring system brought telephones to each suite in J. Alvin. In 1985, the last major renovation of J. Alvin took place. The $1 million project enclosed the courtyard into an atrium and upgraded the HVAC systems and plumbing. In June 2004, women were temporarily housed in J. Alvin, during a summer term session, the only time women students were housed in the hall. For some residents, J. Alvin has become a family tradition. Students today continue to think of J. Alvin as a home away from home. John Brown University is a private Christian university, ranked No. 2 overall and No. 1 Best Value among Southern regional colleges by U.S. News & World Report and listed as one of America’s Best Colleges by Forbes. JBU enrolls more than 2,200 students from 40 states and 39 countries in its traditional undergraduate, graduate, degree completion and concurrent education programs. JBU is a member of the Council for Christian Colleges and Universities and a founding member of the Evangelical Council for Financial Accountability. 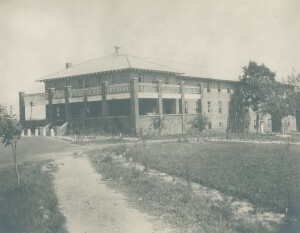 J.Alvin Brown_1935: J. Alvin Dorm circa 1935 – The original north wing of the J. Alvin dormitory consisted of 44 rooms containing 3-stacked cots. 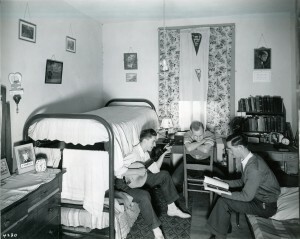 J.Alvin Brown_1940 Dorm Room: J. Alvin dormitory circa 1940 – World War II depleted the population of male college students on John Brown University. At one point during the war, there were only eleven men enrolled on campus. 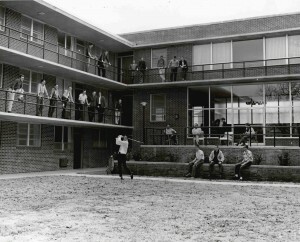 J.Alvin Brown_1961: J. Alvin residence life circa 1961 – The second wing added an open-air atrium, which served as a central location for many campus activities. J.Alvin Brown_2012: J. Alvin dormitory, originally constructed in 1922, is currently the oldest permanent structure on John Brown University’s campus.